You like to leave harbour on a Friday afternoon for a fantastic weekend of sailing. There is a good wind so the sails are quickly filled and the weather stays great for the entire weekend. Onboard, your Mastervolt system ensures that you do not have to worry about a thing. Your navigation station includes GPS, plotter, wind meter, speedometer and depth gauge. You prefer optimum ease of operation; centrally located. Due to short cable lenghts, 12 volt has been selected. 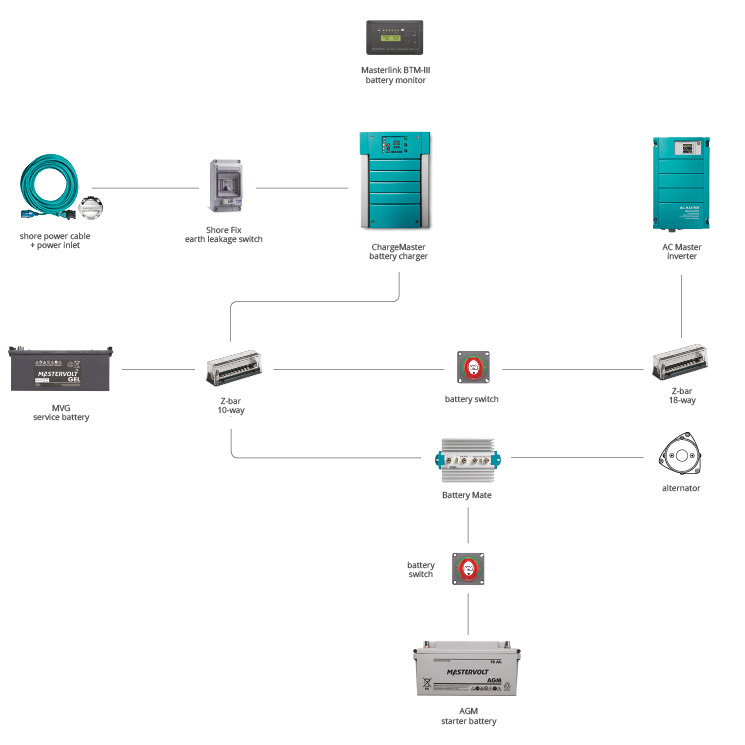 A system with separate charger and inverter provides the highest flexibility and reliability. The charger will always provide the optimum charge even when the available shore power is limited, fluctuating or unreliable. The inverter will provide a perfect true sine wave output to your sensitive onboard electronics. Power is available when you need it. The total of AC and DC consumers requires around 1.2 kWh. Totally discharging the batteries is not advisable so opt for a maximum of 50 % discharge = 2.4 kWh. Taking into account ease of installation and the amount of standard equipment (such as lighting) we selected a 12 V system. 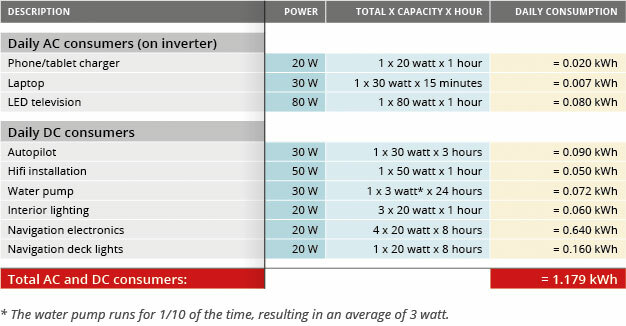 The required battery capacity is therefore 2.4 kWh/12 V = 200 Ah. In normal conditions we assume 25 % of the battery capacity when selecting a battery charger: 25 % of 200 Ah requires a 50 A battery charger. In this case the ChargeMaster 12/50-3 is an excellent choice. It is even able to charge up to three battery banks. In this case you only use two outputs: One for the service battery and one for the starter battery of the engine. This gives you flexibility should you want to add another battery later. Furthermore, you can use this third output as a second starter battery if you have two engines, or for a bowthruster battery. The Masterlink BTM-III battery monitor provides an accurate indication of the current, amperage, time remaining and remaining capacity of battery bank 1, and the current and estimated capacity of battery banks 2 and 3. The built-in microprocessor calculates the remaining capacity and stores historic data. 1 x Battery Mate 1602 IG; the ultimate solution for charging several batteries simultaneously, compatible with any type of alternator/charger. 1 x Z-bar 200 A 18-way.